Risotto made from broken pieces of pasta for those lonely nights when you don’t have rice in the cupboard! My Italian friends, please look away. Really, this recipe is not for you. You will probably hate me for this! For everyone else, have a look at this tasty twist on the classical risotto! Everyone can make risotto from rice… So let’s go into a different direction today! Broken pasta shards are an awesome substitute for those grains of rice. The process basically works exactly the same though. You toast up your carbs, add some stock, stir a lot, add some more stock, stir some more, sprinkle in parmesan and boom – deliciousness! I sometimes use this recipe when there is no more rice in my cupboard. Broken pasta will do the job just as fine. The inspiration for this idea came from a recipe for an Indian dessert dish that used thin vermicelli noodles for a rice-pudding instead of the usual short grain rice. How do you get broken pasta shards, you might ask yourself… Well, the easiest way is to put your pasta in a closeable ziplock bag and smash the heck out of it with a rolling pin. I’ve also used a pestle and mortar for this in the past. Everything will work. Just make sure it’s properly broken into tiny pieces. Want this dish vegetarian? Just skip the bacon and replace with some more dices veggies! Have any other ingredients over? Just throw them in there as well! I added some olives, sliced red pepper and arugula when I made the dish for the photo. Try the recipe – it’s super easy to make and is done in no time! Delicious creamy risotto, but this time made with pasta! Stir up a very un-Italian but extraordinary risotto! Finely dice the onion and the garlic. Heat up your chicken stock in small pot until it is almost boiling, then return the heat to a simmer. Having hot stock ensures that the cooking process of the pasta is not stopped when you add the stock. Put a another pot on medium high heat, add a splash of olive oil and fry the diced onion, garlic, bacon, as well as the pasta pieces for 5 minutes. Once the onion has become translucent and the bacon starts to brown, add the white wine and 1/3 of the hot stock. The pasta will need about 12 minutes in total, so bring to a boil, give the mix a good stir and simmer for 7 minutes. Stir once a while to make sure nothing sticks to the bottom of the pot. If the pasta has absorbed most of the liquid add the second 1/3 of the stock. Add the frozen peas for the last 5 minutes of cooking time. This will make sure the peas will still have some crunch. Add the last bit of the stock and stir until all liquid is absorbed. Try the pasta and if it’s al dente, remove the pot from the heat. Stir in the grated parmesan cheese and season with black pepper. 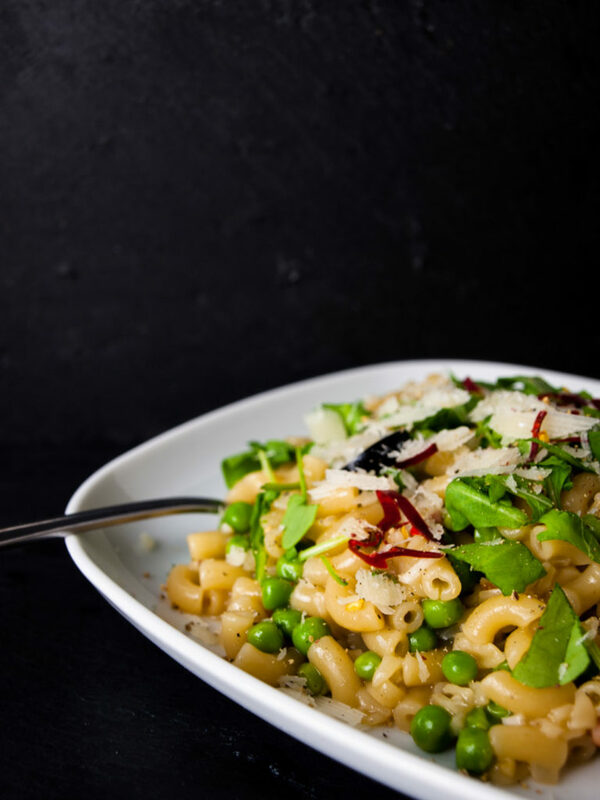 Garnish with some parsley and serve your delicious broken pasta risotto immediately! Let me know what you think about the recipe in the comments below! Ever made risotto with pasta before? Do you still prefer rice over this or do you think pasta is valuable substitute? Doesn’t it feel liberating to smash up the pasta pieces?! Previous Post When in Prague, thou shall eat sausage and drink beer!